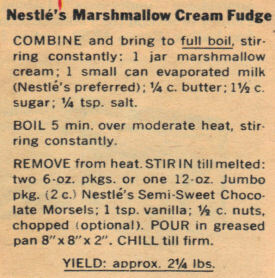 This promo recipe from Nestle’s was clipped from a magazine and found in a large collection, date unknown. I’ve typed it below along with a scanned copy. COMBINE and bring to full boil, stirring constantly: 1 jar marshmallow cream; 1 small can evaporated milk (Nestle’s preferred); 1/4 c. butter; 1 1/2 c. sugar; 1/4 tsp. salt. REMOVE from heat. STIR IN till melted: two 6-oz. pkgs. or one 12-oz. Jumbo pkg. (2 c.) Nestle’s Semi-Sweet Chocolate Morsels; 1 tsp. vanilla; 1/2 c. nuts, chopped (optional). POUR in greased pan 8″x8″x2″. CHILL till firm. YIELD: approx. 2 1/4 lbs.